We chose this 4-day Disney Bahamian cruise for a short winter getaway with our daughter, son-in-law and grandson, who is almost 2 years old. We had cruised by ourselves or with friends before on Holland America and Oceania but this was our first kid-focused cruise and first cruise with Disney. 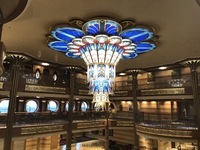 There were many positives: 1) Embarkation and disembarkation were both very smooth processes - we took the Disney Cruise transfer from our resort to Port Canaveral. With stops to pick up guests at 2 other resorts, it took us just over an hour to get from our resort to the port. The transfers were very well organized. Once we got to the port, it took us no more than 15-20 minutes to register and get on board. For disembarkation, Disney provided a nice, early (6:45 am) sit down breakfast at one of the main dining rooms, where we were served by our regular waiters. That was a nice touch. The transfer to the airport was very good. 2) Ship itself is beautiful. 3) Ship is very well maintained - given the focus on short cruises and large number of children on each cruise I expected the ship to look "well used". That wasn&apos;t the case at all. The ship was impeccable. 4) Our deluxe veranda stateroom was great - clean, everything worked, lots of storage space. We liked the 2 room bathroom set-up - toilet and sink in 1 room, sink and bath/shower in the other room very much. Our room steward was readily available for questions and kept the room in perfect shape. 5) The quality of the food was surprisingly quite good - I would say at least as good as on Holland America, although not at the Oceania level. We also ate once at the Italian speciality restaurant, Palo, which was excellent. 6) Activities - there are different streams for young children, teens, families and adults. There are tons of things to do on board, many at no extra charge. 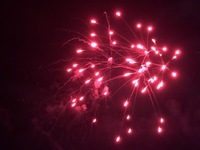 7) Shows are excellent - excellent entertainment in general 8) Service - truly exceptional. Our waiters were fantastic with our little guy. Moreover, they were great in helping my wife with her dietary restrictions. Within a day or two it seemed that everyone on board knew our little guy&apos;s name and he was happily giving fist bumps, high fives and waves to various crew members. Bar staff, staff in stores, photographers - everyone we met provided excellent service. Bravo Disney!!! 9) Disney Magic (children) - our little guy loved the character meet and greets - the Disney characters are great with little kids, interact so well with them & take the time with each person to make them feel special. For example, while on Castaway Cay, seeing Pluto play in the sand with our grandson brought a big smile to my face. There were a lot of opportunities to meet the Disney characters on the ship. There are also Disney movies playing, the Disney shows, even Mickey shaped waffles and a special Haagen Daaz type Mickey ice cream sandwich for kids for dessert. 10) Disney Magic (adults) - Started from the moment when we got on board, when we were greeted by a number of crew members as we got on the ship and our family was "formally" introduced. That was a nice touch. We found there are many adult-only areas and activities when you want a break from the kids. 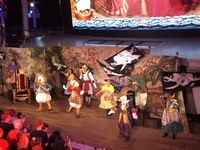 Some of the things we saw really impressed me - for example, Pirates night (as opposed to formal nights on other cruise lines) was a lot of fun. I couldn&apos;t believe how seriously everyone took it - crew members, Disney characters and many, many passengers all dressed up in costumes. And our dinner at Animators Palate, which is one of the 3 rotational main dining rooms, was a terrific experience. The interaction with the Disney characters, in this case Crush, on the screen by our table, just totally blew me away. Wonderful!!! 11) Castaway Cay, Disney&apos;s private island, is lovely. There is a lot going on and a lot to do, if you are so inclined. It is nice that there are plenty of lounge chairs with umbrellas (free) so you don&apos;t have to pay for a clamshell to have some shade. 12) We took a couples massage at the adult beach, Serenity Bay, on Castaway Cay. That was a wonderful experience that I would highly recommend. 13) Dining (dinner) is at set times - either the main seating at 5:45 pm or the late seating at 8:15 pm. With our little guy, we really wanted the 5:45 pm seating. But we booked this cruise fairly late and so when we booked they could only give us the late seating. However, we asked to be put on the waiting list for the main seating. And when we reviewed our reservations a few days before boarding we saw that we had been switched to the main seating. Yay Disney! 14) Rotational dinners - we liked the idea of having dinners in 3 different main dining rooms, each with different themes&apos; and that our waiters followed us to each of the different dining rooms. That was perfect for us. There were also a few things we didn&apos;t like as much: 1) Most importantly, the ship was very crowded. For major events, like the sailaway party and the Pirates night party, the open area on Deck 11 was just a mass of humanity. There were children everywhere - I know, this was a Disney Cruise, so what do you expect...? Still, there was a lot of activity and noise, with kids running down the corridors outside our stateroom and shouting at 11 pm, a zoo-like atmosphere at the 2 children/family swimming pools. There are 1250 staterooms on the Disney Dream so normally that would translate into 2500 passengers on the cruise, assuming 2 people per stateroom. However, in that this is a family cruise, there are often 3, 4 or even 5 people per stateroom, so the net result is over 4000 passengers on board. That is a lot of people for a ship of this size. 2) Kids are offered chocolate donuts 1st thing at breakfast, Mickey waffles, unlimited soft ice cream and sodas during the day (self serve), lots of cookies, cakes and other sweet desserts at buffets and meals (e.g. our Mickey Haagen Daaz type ice cream sandwiches). That might explain why there seemed to be some kids who were virtually bouncing off the walls. There were some healthy choices but they were kind of limited. 3) We didn&apos;t care for the buffet at Cookies on Castaway Cay. We found it very ordinary. 4) I also found that the buffet at Cabanas (on deck 11) did not have as much selection and was not as good, quality-wise, as buffets on other ships. All in all we had a great experience on the Disney Dream. We liked it so much we wanted to stay on for the following cruise but unfortunately it was fully booked. A four day cruise is very short. Given our great experience, we plan to book another Disney Cruise but next time will probably go with a longer cruise, if possible. 1) Embarkation and disembarkation were both very smooth processes - we took the Disney Cruise transfer from our resort to Port Canaveral. With stops to pick up guests at 2 other resorts, it took us just over an hour to get from our resort to the port. The transfers were very well organized. Once we got to the port, it took us no more than 15-20 minutes to register and get on board. For disembarkation, Disney provided a nice, early (6:45 am) sit down breakfast at one of the main dining rooms, where we were served by our regular waiters. That was a nice touch. The transfer to the airport was very good. 2) Ship itself is beautiful. 3) Ship is very well maintained - given the focus on short cruises and large number of children on each cruise I expected the ship to look "well used". That wasn&apos;t the case at all. The ship was impeccable. 4) Our deluxe veranda stateroom was great - clean, everything worked, lots of storage space. We liked the 2 room bathroom set-up - toilet and sink in 1 room, sink and bath/shower in the other room very much. Our room steward was readily available for questions and kept the room in perfect shape. 5) The quality of the food was surprisingly quite good - I would say at least as good as on Holland America, although not at the Oceania level. We also ate once at the Italian speciality restaurant, Palo, which was excellent. 6) Activities - there are different streams for young children, teens, families and adults. 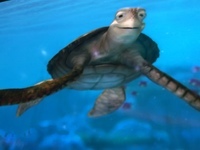 There are tons of things to do on board, many at no extra charge. 8) Service - truly exceptional. Our waiters were fantastic with our little guy. Moreover, they were great in helping my wife with her dietary restrictions. Within a day or two it seemed that everyone on board knew our little guy&apos;s name and he was happily giving fist bumps, high fives and waves to various crew members. Bar staff, staff in stores, photographers - everyone we met provided excellent service. Bravo Disney!!! 9) Disney Magic (children) - our little guy loved the character meet and greets - the Disney characters are great with little kids, interact so well with them & take the time with each person to make them feel special. For example, while on Castaway Cay, seeing Pluto play in the sand with our grandson brought a big smile to my face. 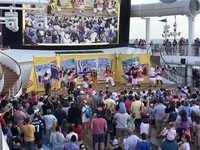 There were a lot of opportunities to meet the Disney characters on the ship. There are also Disney movies playing, the Disney shows, even Mickey shaped waffles and a special Haagen Daaz type Mickey ice cream sandwich for kids for dessert. 10) Disney Magic (adults) - Started from the moment when we got on board, when we were greeted by a number of crew members as we got on the ship and our family was "formally" introduced. That was a nice touch. We found there are many adult-only areas and activities when you want a break from the kids. Some of the things we saw really impressed me - for example, Pirates night (as opposed to formal nights on other cruise lines) was a lot of fun. I couldn&apos;t believe how seriously everyone took it - crew members, Disney characters and many, many passengers all dressed up in costumes. And our dinner at Animators Palate, which is one of the 3 rotational main dining rooms, was a terrific experience. The interaction with the Disney characters, in this case Crush, on the screen by our table, just totally blew me away. Wonderful!!! 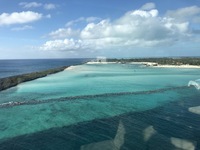 11) Castaway Cay, Disney&apos;s private island, is lovely. There is a lot going on and a lot to do, if you are so inclined. It is nice that there are plenty of lounge chairs with umbrellas (free) so you don&apos;t have to pay for a clamshell to have some shade. 12) We took a couples massage at the adult beach, Serenity Bay, on Castaway Cay. That was a wonderful experience that I would highly recommend. 13) Dining (dinner) is at set times - either the main seating at 5:45 pm or the late seating at 8:15 pm. With our little guy, we really wanted the 5:45 pm seating. But we booked this cruise fairly late and so when we booked they could only give us the late seating. However, we asked to be put on the waiting list for the main seating. And when we reviewed our reservations a few days before boarding we saw that we had been switched to the main seating. Yay Disney! 14) Rotational dinners - we liked the idea of having dinners in 3 different main dining rooms, each with different themes&apos; and that our waiters followed us to each of the different dining rooms. That was perfect for us. 1) Most importantly, the ship was very crowded. For major events, like the sailaway party and the Pirates night party, the open area on Deck 11 was just a mass of humanity. There were children everywhere - I know, this was a Disney Cruise, so what do you expect...? Still, there was a lot of activity and noise, with kids running down the corridors outside our stateroom and shouting at 11 pm, a zoo-like atmosphere at the 2 children/family swimming pools. There are 1250 staterooms on the Disney Dream so normally that would translate into 2500 passengers on the cruise, assuming 2 people per stateroom. However, in that this is a family cruise, there are often 3, 4 or even 5 people per stateroom, so the net result is over 4000 passengers on board. That is a lot of people for a ship of this size. 2) Kids are offered chocolate donuts 1st thing at breakfast, Mickey waffles, unlimited soft ice cream and sodas during the day (self serve), lots of cookies, cakes and other sweet desserts at buffets and meals (e.g. our Mickey Haagen Daaz type ice cream sandwiches). That might explain why there seemed to be some kids who were virtually bouncing off the walls. There were some healthy choices but they were kind of limited. 3) We didn&apos;t care for the buffet at Cookies on Castaway Cay. We found it very ordinary. 4) I also found that the buffet at Cabanas (on deck 11) did not have as much selection and was not as good, quality-wise, as buffets on other ships. All in all we had a great experience on the Disney Dream. 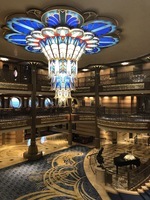 We liked it so much we wanted to stay on for the following cruise but unfortunately it was fully booked. A four day cruise is very short. Given our great experience, we plan to book another Disney Cruise but next time will probably go with a longer cruise, if possible. 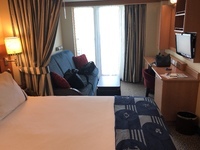 Standard size veranda stateroom - very clean, everything worked, very functional. We were very happy with our room. Island itself is great. 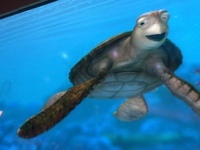 Beach is excellent and we appreciated opportunities for the kids to meet the Disney characters on the island. Only disappointment was the buffet meal at Cookies - very ordinary. While we were there we went for the couples massage at the adult beach, Serenity Bay. That was a terrific experience. Lovely spot to chill. With our little guy we stayed at the family beach on the lagoon. Weather was perfect. We rented 2 beach umbrellas ($25 each) which came with 2 drinks each. magic moment - drinking our Bahama Mamas on a beautiful, sunny, warm day with a light Caribbean breeze, turquoise blue water. Life doesn&apos;t get much better than that. After enjoying 19 years of Disney cruising, many changes for the worse.